Mexican-American preschoolers lag behind their white peers when it comes to early language and literacy development, but their social-emotional skills are just as strong, according to new findings from researchers at the University of California, Berkeley, and the University of California, Los Angeles. 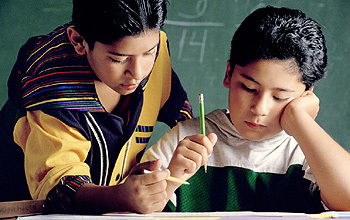 The researchers found that Mexican-American children between the ages of 2 and 3 demonstrated language and cognitive skills that were seven months behind those of white peers, whether they were assessed in English or Spanish. That gap lasted through the beginning of kindergarten. At the same time, however, the researchers found that the social skills of these same children rival those of their white peers, despite their lagging literacy and despite coming from more impoverished households. Those findings build on other recent research that has shown that immigrant mothers—particularly those of Mexican heritage—provide stable, loving parenting that leads to strong social-emotional skills for their young children. These same mothers, however, are less likely to read to their young children than their white counterparts. The new report—which appears in the Maternal and Child Health Journal—tracked a national sample of 4,700 children who were born in 2001 over a three-year period, when they were between the ages of 2 and 5, and not yet enrolled in kindergarten. Two-thirds of the children in the sample were Mexican-American. Nearly half of Mexican-American children were read to once a week or less, the researchers found, compared to just 14 percent of white parents who read to their children that infrequently. Researchers said the findings challenge widespread assumptions about the early development of Hispanic children and should make teachers, pediatricians, and other health care providers cautious about assuming that Mexican-American children who display delays in language or cognitive development are also lagging in social-emotional development. These findings should certainly help early-educators and advocates make the case for more programs such as “Abriendo Puertas/Opening Doors” that specifically target Latino parents and help them address those early-learning gaps in their children.